A concept bar-art gallery-cafe that offers casual fine dining along with clothing, handmade handbags, imported houseware and fine Vietnamese condiments has been a favourite spot for diners in HCM City for nine years. Located at 19 Lê Thánh Tôn Street, one of the restaurant hubs in downtown HCM City, in a four storey building of French colonial style, L’Usine has a seating capacity of 150 visitors. The classic building is designed into three main parts: a dining area, a bar and a fashion store for showing and selling pantry consignment items. The stylish venue is a harmonious combination of both classic and modern decoration features, creating a vibrant ambiance. The restaurant is open every day for breakfast, lunch and dinner, and boasts an extensive drink list with everything from Vietnamese black coffee to espresso coffee, specialty teas and fresh fruit smoothies to wines and signature cocktails. The creative, modern menu is another counterpoint to the refined surrounds of a traditional colonial-era building, resulting in a truly unique dining experience. 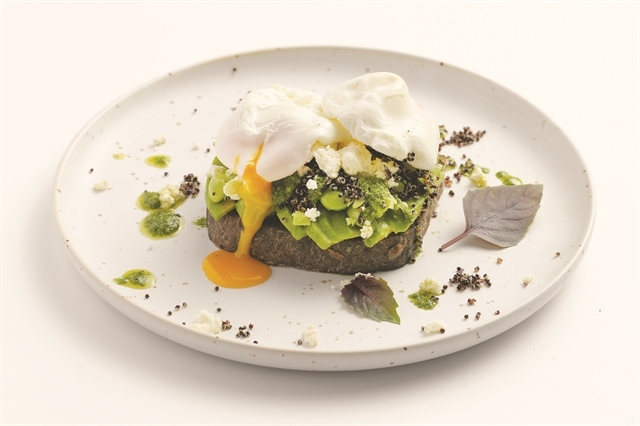 Avocado toast impresses diners with its eye-catching decorations. VNS photo Minh Phi. 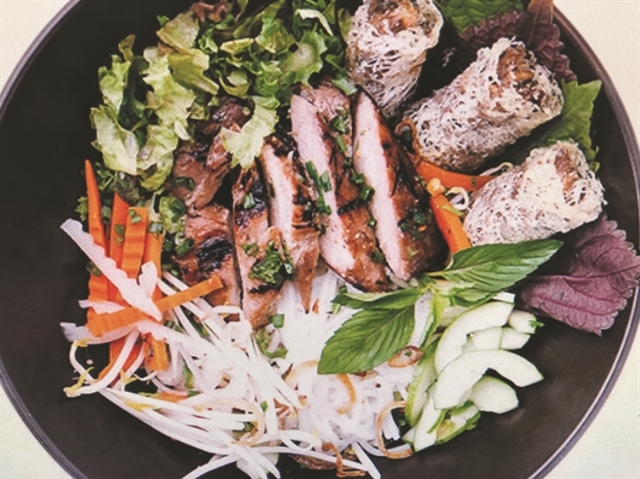 Headed by Australian chef Nicholas de Gersigny, L’Usine’s menu features a fine selection of western and Vietnamese dishes, ranging from beef, chicken, duck and pork to salmon, prawn and clams, starting from VNĐ120,000 for a salad and from VNĐ140,000 for a main course. At L’Usine, diners have a chance to discover unique qualities in food preparation and decoration. “Good food should be healthy and nutritious, with fresh ingredients. It needs to be exquisitely prepared and beautifully garnished. Hence, we give special care to all these aspects to please our diners,” said de Gersigny. Lovers of western foods should not miss the delicious fried haloumi burger (VNĐ230,000), a standout item at L’Usine or stunning avocado toast (VNĐ180,000) which often impresses eaters with its eye-catching garnishes. Other must-tries include salmon toast with capers, pickled shallots on soy and linseed bread (VNĐ190,000), and pan-fried salmon with turmeric potato gratin and edamame mash (VNĐ345,000). 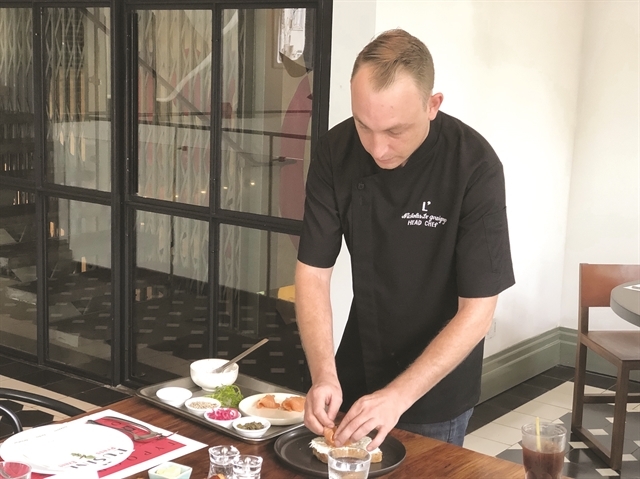 The talented Australian head chef has also selected Vietnamese favourites like grilled pork bánh mì (VNĐ95,000); bún thịt nướng chả giò tôm, or rice noodle salad with grilled pork, prawn spring rolls, peanuts and sweet and sour fish sauce (VNĐ145,000); cơm gà L’Usine, chicken rice L’Usine style (VNĐ140,000); and bún bò or spicy beef noodle soup (VNĐ130,000). During my recent family dinner, we wanted to try only western favourites, so I ordered the classic beef lasagna (VNĐ200,000) for my son and a fried haloumi burger (VNĐ230,000) for my daughter. I love baguettes for breakfast and often have it with pork Vietnamese style, but this time I selected a baguette with roasted beef, tomatoes, pickles and pesto mayonnaise (VNĐ180,000) for dinner. While waiting for the food, we walked around the gallery area where selected fashion and houseware labels like Cheap Monday, Dr Denim Jeansmakers, RagBone, Men's Society - Gifts and Accessories, Voluspa, Sunnylife, Madam Stoltz, and Wild & Wolf were on display for sale, including apparel, footwear, tote bags, handbags, suitcases, hats, souvenir candles, and others. L’Usine’s stylish tote bags caught my eye for their colour and materials, while my twins were interested in exceptional souvenirs like colourful field glasses, small candle cups and key rings with fantastic images. When the waiter brought out the classic beef lasagna, we were more than ready for the dish, which was tantalising and rich in cheese. It was a bit late for dinner (around 8:20pm) so my son, who was ravenously hungry, began eating right away. I sampled the dish and was unsure how the beef was cooked, but it was fresh and juicy, with well-chopped beef which melted in my mouth. Finally, our other orders came, a fried haloumi burger and roasted beef baguette with tomatoes, pickles and pesto mayonnaise. The two items were too big for both of us, and so, as usual, we shared and took away the remaining. We both loved the burger as it was unlike others we had tried before. The homemade sauce made it irresistible, a must-try for all burger lovers! As for the beef baguette dish, it was so large we took home half of it. The stunning selection of desserts was also a central part of the menu and the must-tries included double chocolate cake and apple tarte tatin at VNĐ80,000 each, and red velvet cake at VNĐ120,000. Both my kids are fans of ice cream so it was hard for them to finish their meal without trying vanilla and chocolate, as recommended. But they asked for the chocolate brownie (VNĐ70,000) and chocolate lava cake (VNĐ90,000), which came with one scoop of vanilla ice cream and chocolate cake. As lovers of chocolate-related sweets, my twins enjoyed every bite of the desserts. ”It was more than fantastic, mom. I would choose this again,” my nine-year old son said. Comment: All-day casual dining, Asian and western cuisine in a renovated French colonial house. L’Usine has two other locations in District 1, at 151/5 Dong Khoi Street and 70B Le Loi Street.